An online collection of digitized antique maps of European and Mediterranean lands and countries, like the Rocque Post-Roads map of 1781, a map of Poland in 1752, the Thurn & Taxis Post-Roads of 1786, the North Africa Bonne map of 1783 and many more rare documents . 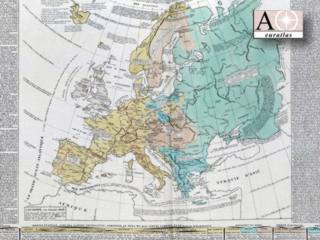 Several maps are available in good legible quality and most maps can be purchased in the Euratlas Shop. In 1802, Emmanuel de Las Cases, under the pseudonym of A. 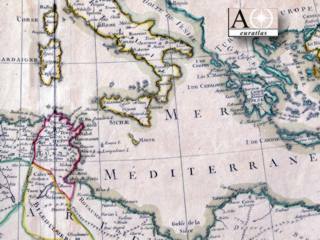 Le Sage, published a monumental Historical Atlas. This work was a great success in Europe and went reprinted several times till ca. 1845. Las Cases, companion of Napoleon in Saint Helena, is famous for the Mémorial de Sainte-Hélène but his Atlas marks also a stage in the study of history because he his the first to explain historical events through charts and maps. Here all the 33 sheets of the 1808 edition as .jpg images and each page is zoomable. Drawn in 1265 and made up of 11 parchments scrolls measuring approximately 34 cm high by 6,74 m. long when assembled, this document was discovered in 1494 and given in 1507 to an Antiquarian of Augsburg, Konrad Peutinger. 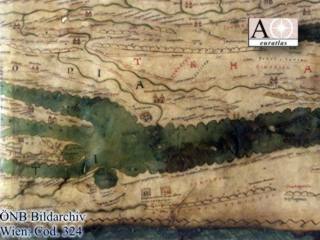 This document appears to be a planisphere describing the world as it was known in Antiquity. The Tabula Peutingeriana is conserved at the Austrian National Library (Österreichische Nationalbibliothek) and this online full version is presented here with the authorization of this institution.